Highly palatable gel bait that provides cockroach control like no other. ADVION Cockroach Gel is not only irresistible to cockroaches; as a leading bait solution, its powerful mode of action controls the entire population. Use it once and trust it will work the first time – resulting in more satisfied clients and less call backs for your business. How does ADVION eradicate the entire cockroach colony? 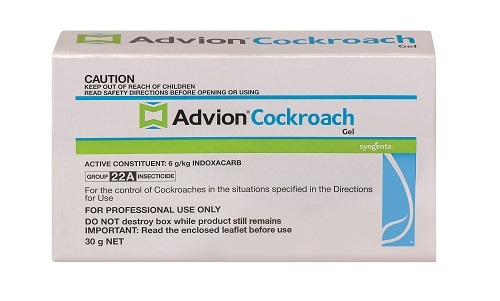 ADVION is powered by indoxacarb: an active ingredient with a unique mode of action that spreads rapidly to other cockroaches. Once a cockroach is exposed, it unleashes a three-step chain reaction. ADVION is spread through the population through normal cockroach behaviours (e.g. ingestion of faeces and secretions), resulting in the quick elimination of cockroach infestations. Note: Never apply synthetic pyrethroid products with ADVION gels, as this will slow both the consumption of bait and control of the population.